You guys! 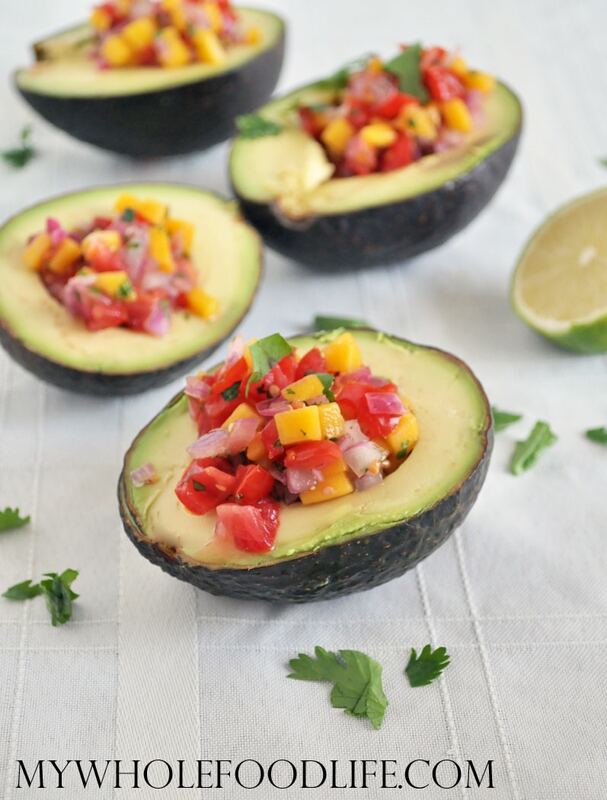 These Avocados with Mango Salsa might just be the most delicious things I have ever eaten. That is saying a lot!! You all know I love avocado recipes, so I know this would be a winner. If you like my Pineapple Mango Salsa, then you will love this too. It’s the perfect dish for summer. No cooking required! This recipe fits all diets. It’s gluten free, vegan and even paleo. If you wanted to add some extra protein, I think black beans would go well in here also. Or even quinoa. I thought they were just perfect this way. I am a wimp with spicy food, but if you like things spicy, you can also add jalapenos. My husband would love that! The perfect healthy treat for summer! In a small bowl, mix all the ingredients, except the avocados. Remove the avocado pits and place some salsa inside each one. These are best when served immediately, but they will keep in the fridge for 3 to 4 days if you squeeze some extra lime juice on the avocados. Is this one serving or 3? 1/2 an avocado with the salsa is one serving.